If you haven’t seen this video from actor and House of Cards star Kevin Spacey, it’s worth the five minutes of your time. The speech, edited and served up by the folks at Telegraph UK, contains a road map for brand storytelling worthy of global enterprise brands. In case you aren’t already familiar with the Netflix-produced original series, House of Cards, it was considered a risky move in the world of episodic “television” content for many reasons. Notable among them is that, unlike most traditional TV shows — which film a pilot, get network funding, then produce and release episodes one at a time over the course of a season — all 13 episodes of House of Cards were released on a single day. The success of House of Cards (as well as that of the latest Netflix series to be released en-masse, Orange is the New Black) proves that this distribution model can work. But how might it apply to content marketing, which operates in vastly different ways than the business of television? And, more specifically, how might a nontraditional release schedule like this impact corporate storytelling? We at CMI have spoken with many marketers who still believe it’s almost impossible to rise above the “content clutter.” To be honest, this has always been the case. But we have come to understand that epic corporate storytelling will always rise to the top, as customers covet truly unique insights. Thankfully, helpful and informative content is now considered the rule, rather than the exception. Do you want social media and other new media to work for you? Give your customers the necessary assets, and enable them to engage with your stories in innovative ways — ways that may even astonish your management team. The audiences are out there, just waiting for you to provide them with these opportunities. I get frustrated when I find marketers that belittle their content marketing to such a degree that they only create it in 140-character strings. As Spacey details, some of the best stories in the world take time to play out. They simply cannot be told in one blog post, or one video, or one tweet. Would House of Cards have been nearly as engaging if it had been whittled down to a story that could be told in a single episode? When it comes to content marketing, producing long-form, consistently shared corporate storytelling efforts has always been, and still remains, the best way to build lasting relationships with customers. But, to deliver on this promise requires a sound strategy, advance planning, and the ability of marketers to think beyond the campaign. Netflix chose to fund House of Cards (after virtually every other network turned it down) because data showed that its audience wanted this type of content. While many of us might long for the consumer behavior insights that Netflix has access to, we all have an abundance of analytics data we can easily tap into, if we so choose — no matter how small our company may be or how limited our resources. What blog posts are working best for your marketing objectives? What webinars or videos have you created that have helped move your customers through their buyer’s journey? The data exists — you just need to capture and leverage it to create stories that will position your business as the go-to resource in your content niche. 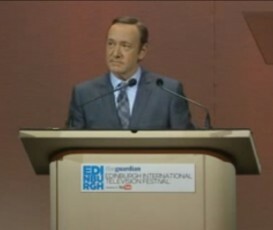 Perhaps we should get Kevin Spacey to speak at Content Marketing World 2014? Do the views he shares in the video resonate with your corporate storytelling and content marketing strategy? Let us know your thoughts. Joe Pulizzi’s latest book, “Epic Content Marketing,” will be released in September 2013. Preorder it now on Amazon.com.